EBR-1 was a breeder because it created ("bred") more uranium atoms than it consumed. It was the first facility to produce both new plutonium-235 and generate sufficient electricity to operate itself. 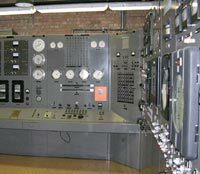 It started producing electricity on December 20, 1951, and was operational whenever the reactor was engaged until it was decommissioned in 1964. There were plenty of "firsts" developed at this facility. One of these was the use of NaK (pronounced "nack"). Nuclear reactors have a serious problem with controlling the heat that arises from a nuclear reaction. 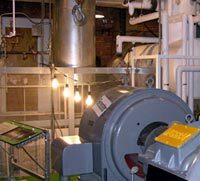 The cooling system developed here used a combination of sodium (Na) and potassium ( K). NaK was chosen because it stays liquid at a large range of temperatures, and it was very efficient at transferring heat away from the reactor. However, NaK burns and explodes when exposed to water and air. There are still lots of signs around the reactor museum warning about the dangers of exposing NaK to water. In addition, NaK corrodes metal, which meant the designers had to design an electromagnetic pump with no internal moving parts to keep the NaK moving. One of the amazing things about the EBR-1 tour is that you can stand directly above the reactor core. There is a plastic viewing port in the floor that allows you to see the top of the stainless steel tank the comprised the core. But the most amazing and downright unnerving experience is that you can walk directly into the "reflector repair room." This shielded room was where the various components of the radioactive fuel were inspected and manipulated. 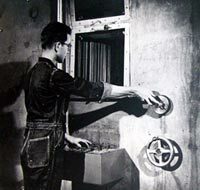 In particular, the operator would remove and replace the uranium-238 bricks that surrounded the reactor core. The windows and walls were 39 inches thick and remote manipulators were developed to move the materials. During my visit, I tried several of the manipulators, and it was amazing how much dexterity they provided. In the early 1950s, the US government began a project to build a nuclear-powered jet bomber. In July, 1959, the largest arched concrete hangar in the world to date was built to house this futuristic aircraft. Two of the engines that were built and tested for this project are in the parking lot of the EBR-1. Although the two structures surrounding the test engines are huge, the actual engines, including their reactors, are only about ten feet long. 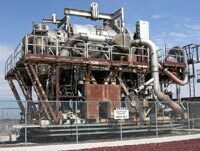 The superstructure that surrounds each of the test engines was built to keep the engines from blasting off into the desert and to hold the scientific testing instruments. The program was eventually cancelled by President Kennedy in March, 1961, and no aircraft was ever built, but the engineers at this facility proved that such a jet propulsion system was possible. It may even viable some day in the future.